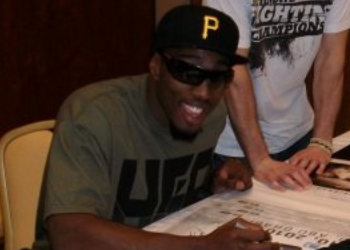 Phil Davis (Pictured) has managed to parlay his collegiate championship wrestling résumé into a perfect 9-0 mixed martial arts record. While most believe his best shot at upsetting Rashad Evans at “UFC on FOX” rests solely on his ability to keep Evans’ back pinned on the mat, “Suga” doesn’t seem a bit worried about Davis’ grappling game. In fact, the former UFC light heavyweight champ believes Davis can’t hold a candle to his wrestling game, let alone hold him down to be able to collect his 10th victory. “He’s delusional,” Davis said in response to Evans’ claims during Wednesday’s media workouts. “If he thinks he’s going to out-wrestle or intimidate me, he’s in for a shock on Saturday night. I’ve been working hard for this, I can’t wait to get back into the Octagon after a layoff. He’s not as good as he thinks he is and I am better than he thinks I am. While Evans did acknowledge Davis’ accomplishments at Penn State might trump what he did at Michigan State, he was also quick to point out there is a significant difference between wrestling and the wrasslin’ that’s required in a high-caliber MMA scrap. Evans also spotlighted the fact Davis has never faced a fighter of his stature or competed when the stakes were this high on a stage this large. Nonetheless, “Mr. Wonderful” is prepared to silence his biggest critic in resounding fashion. The light heavyweights meet inside United Center in Chicago, Illinois. Their 205-pound affair headlines the Octagon’s return to primetime television.